In a statement released on Friday afternoon, Deputy Press Secretary Matt Chandler said, "In order to ensure that the millions of Americans traveling this holiday season are not disrupted," DHS would extend the required Dec. 31 Real ID material compliance deadline, which required states to meet 18 interim benchmarks that support the regulation. The criteria include improvements in driver's license and ID card physical security, authentication of source identity documents and protections of applicant's biographical data. The May 10, 2011, deadline for full compliance remains in effect, Chandler said, adding that "Congress must act to address systemic problems with the Real ID Act to advance our security interests over the long term." DHS Secretary Janet Napolitano has made no secret of her objections to Real ID, supporting instead efforts to enact PASS ID, which would require states to issue driver's licenses that are compliant with federal security standards by 2016 and create a $150 million grant program to help states digitize birth records. Last week, the department announced $48 million in grants for states "to help prevent terrorism, reduce fraud, and improve the reliability and accuracy of personal identification documents," Chandler said. NEWSFLASH - Mainstream, alt-news makers and pundits use a common polarizing tactic known as spin every day. Spin defined for us usually is clearly polemicized reporting from a blogger taking shots at a political stance or action. It’s a line or two at the bottom of some copy. It could be a graph to cast a negative and sundry light on those who espouse an undesired perspective. So far, these rulings have not resulted in detainees' being released in the United States. But that is only because, at present, the detainees are physically kept outside of the country. In the 2005 Real ID Act, Congress barred aliens who either have been members of terrorist organizations or have received paramilitary training in terrorist camps from entering our nation. Though one judge has tried to order detainees released here regardless, his order was reversed on appeal. Other judges have been hesitant to hold that their power to review detention rulings implies a power to order detainees released, much less released in the United States, in defiance of statutory proscription. Under the subheader, Next They'll Put a Chip in Your Brain, AlterNet made sure to single out an African American Tea Party member paying negative tribute to his awareness of the incorporation of RFID technology in licenses. They also made sure to illustrate, Nate of the LA Tea Party, wasn’t doing enough for the black race and that he’s clearly guilty of being an Obama apostate. While RFID does have disastrous implications if allowed to move forward without certain vigilance, AlterNet’s bloggers won’t be there to insure you if there’s a massive digital invasion of your life personally. They can go ahead and take shots at the easy targets [Christian "Teabaggers"] because it’s fun to hate. Kool-Aide, anyone? I’ll go as far as saying that Democrats who don’t find problems with extended surveillance agendas plaguing the US have said, often directly, they have had their identity stolen - what more can they do to us with this license or database agenda? I have to think about what they might really want. They want security in their government. They want protection from terrorists. Somewhere in the Democratic brain, where government is always the best path to problem solving, they may have said - unfunded mandate bad, extra surveillance as a compromise- OK! Which is why the Supermajority might continue to greenlight the PATRIOT Act and subsequent FISA agendas. What the American people are left with is another food fight, but this time to save face over what was obviously a bad idea as the Real ID Act. 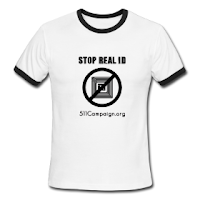 Real ID has become a herald of 10th Amendment actions - nullification. 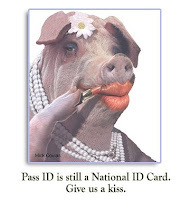 States might think Real ID looks okay but they just couldn't get the nasty taste out of their mouth, no matter the incentive. Real ID is headed for a repeal. No matter what they throw at the likes of me or anyone who defends themselves from individual intrusion it won't ever make Real ID a good and decent law for the benefit of the people. You simply can't polish a turd. "ID cards? They're already dead." - "Oh no they're not!" tracking, vetting and barring, profiling - despite all rumours and spin to the contrary, the database state rolls on. The next several months are particularly risky. Even more so if people think we've already won. Whitehall is doing what it can to entrench database state programmes and initiatives - making them as difficult as possible for a new government to scrap, roll back or disentangle. It won't often be as blatant as the latest push to upload millions of people's medical details onto the NHS Spine (newsletter 137) so we must be more vigilant than ever. A huge thank you to everyone who gives so generously of their time and energy, working with a local group. And special thanks to NO2ID's local and regional coordinators - we couldn't do it without you. As 2009 draws to a close, I wish you and your families a peaceful, surveillance-free Christmas - and here's hoping 2010 will prove to be a good year for privacy and freedom! The FBI issues tens of thousands of security letters to get records on individuals without warrants. Congress investigates and is appalled at the FBI's "underreporting". The FBI promises to do better (see 2009, and 2008 and 2007....). The 4th amendment continues to erode into meaninglessness. * The Transportation Security Administration stops wasting billions of dollars in traveller delays by confiscating water bottles and removing shoes. Instead it focuses on real threats based on rational risk assessment, not security theater based on movie-plots (hat-tip Bruce Schneier). OK, unlikely, but I can dream, can't I? The San Pedro Riparian National Conservation Area in Arizona was the next to feel the brunt of the Real ID Act's destructive power. When the Sierra Club and Defenders of Wildlife challenged the construction of the border wall across this World Heritage site and home of Arizona’s last free-flowing river, a federal court agreed that the Department of Homeland Security had ignored the requirements of the National Environmental Policy Act, and handed down an injunction temporarily halting construction. Rather than comply with the law, DHS Secretary Chertoff waived it, once again suspending the laws that were the basis of a successful suit, along with 18 others. Within days of the waiver, DHS restarted construction. ScienceDaily (Dec. 15, 2009) — Although physicians support the use of electronic health records, concerns about potential privacy breaches remain an issue, according to two research articles published in the January 2010 issue of the Journal of the American Informatics Association (JAMIA), in its premiere issue as one of 30 specialty titles published by the BMJ (British Medical Journal) Group, UK. One published study is based on views of more than 1,000 family practice and specialist physicians in Massachusetts who were asked whether they thought electronic health information exchange (HIE) would drive down costs, improve patient care, free up their time and preserve patient confidentiality. They were also asked whether they would be willing to pay a monthly fee to use the system. The electronic exchange of health information (HIE) among different long- distance providers has become the focus of intense national interest, following recent legislation and moves to offer cash incentives for those who switch to the system. The responses showed widespread support for the use of HIE, even though only just over half were actually using electronic health records. Most (86%) said that HIE would improve the quality of care and seven out of 10 thought it would cut costs. Three out of four (76%) felt that it also would save time. But 16% said they were "very concerned" about potential breaches of privacy, while a further 55% were "somewhat concerned." The authors note that the responses indicate a lower level of concern than expressed by physicians in the UK, but suggest that this might change if breaches occur to a greater extent than currently recognized. Despite their overall enthusiasm, physicians were not willing to support the suggested $150 monthly fee, and nearly half were unwilling to pay anything at all. A second study reported in JAMIA, suggests that mental health professionals have significant concerns about the privacy and security of data on electronic health records. Of 56 responding psychiatrists, psychologists, nurses, and therapists -- out of 120 who were sent the survey--based at one academic medical center, most (81%) felt that the system permitted the preservation of "open therapeutic communications." Most also felt that electronic records were clearer and more complete than paper versions, although not necessarily more factual. When it came to privacy, almost two-thirds (63%) were less willing to record highly confidential information to an electronic record than they would to a paper record. More than eight out of 10 (83%) said they if they were to become a patient, they would not want to include their own mental health records to be routinely accessed by other providers. The authors point out that previously published surveys of patients/consumers have reflected a lack of confidence in tight security, and that people with mental health issues already face stigmatization. While the narrative data of patients' life histories and experiences inform clinical decision-making in psychiatric care, the threat of security breaches makes them vulnerable to potential misuse or misinterpretation, the authors say. Adoption of electronic health records has been slower than anticipated, the authors add. And they conclude: "Designers of future systems will need to enhance electronic file security and simultaneously maintain legitimate accessibility in order to preserve confidence in psychiatric and other [electronic health record] systems." "The ramifications of data security cover more than the psychiatric domain, implying a need for considerable reflection," they say. BTC - AAMVA or the American Association of Motor Vehicle Administrators published every state's progress for benchmarks and compliance. If you are currently unsure of what your state is doing regarding material compliance with the Real ID act or the PASS ID Act coming up for congressional revision; you might want to search this document for your state's DMV or driver's license division. "We are not doing anything about it at this time, at the airline level. Here's why: at this stage it is a "head-butting" contest between TSA, Homeland Security, and Congress, which passed the law. " Year end travelling due to Holiday connections have piqued concerns of those confronted with requests for ID by the TSA . It may be no accident that Real ID's year end deadline begs the focus of those otherwise concerned with other issues like National Healthcare and Climate Change and those flying out on the holiday red eye. BBS Forums like this one are free form vents for those with privacy and travel concerns who understand more than one would ever think. Albuquerque travel journalist, Neala Schwartzberg turns her attention on the demands of some of those who supply travel the most this year. It's turns out, once again, Real ID and what may even be PASS ID won't make the logistical cut for travellers. What are the airlines doing about travellers on domestic flights. Background: Pushed through Congress in 2005 as a tagged-on program to a more crucial bill, Real ID sought to make driver’s licenses a more secure form of identification. Problem was, no one likes the Real ID program. Not even Janet Napolitano, Secretary of Homeland Security. It is expensive, invasive, and stepped all over states rights issues. However, if a state didn’t conform to the requirements spelled out in the bill, residents would not be allowed to fly on domestic flights operated by commercial airlines. A compromise called Pass ID was created instead. However, in the midst of all the other chaos in government, Congress has shown little interest in pushing that bill through. In the meantime, the states, one by one, have made their licenses more and more secure in keeping with the spirit of the law. Currently there are over 30 states that have not agreed to Real ID and are therefore out of compliance. On January 1st, unless an extension is granted by DHS (and it appears they WILL issue that extension), residents of those states have IDs that are not acceptable under the Real ID act and will not be able to use their driver’s licenses for identification for domestic flights. Strangely, the airlines have said nothing at all about this issue. So, I contacted American Airlines and Southwest Airlines, two carriers with a significant presence in Albuquerque and Texas which also cover much of the United States. We are not doing anything about it at this time, at the airline level. Here's why: at this stage it is a "head-butting" contest between TSA, Homeland Security, and Congress, which passed the law. Well, that effectively removes the airlines from the playing field. He continues: "With more than half the states in America unable to comply with the [Real ID] law at this time, we believe that this issue will have to be worked out among those parties in some fashion. We suspect none of them is prepared to turn away tens of thousands of travelers on January 1." Stranded travelers? This had the potential to be a world-class headache for the airlines, and I wondered why American Airlines wasn’t more concerned. Then I spoke with Southwest Airlines spokesperson Brandy King and realized why. "If there is no extension, customers will still be allowed to travel,” said King. How could this be? She explained. "If you lost your driver’s license and had to take a flight you would still be allowed to travel, but you are subject to extra screening." So, for the airlines, this may not be anything really new, although the scale would surely be unprecedented. Several different outlets are noting the quiet passing of a Department of Homeland Security deadline to implement our national ID law, the REAL ID Act. In May of 2008, with many states outright rejecting this national surveillance mandate, the DHS issued blanket waivers and set a new deadline of December 31, 2009 by which states were supposed to meet several compliance goals. They have not, and the threat that the DHS/Transportation Security Administration would prevent Americans from traveling has quieted to a whimper. If I was a betting person (and I am from time to time) I’d bet the backed-up-down-the-corridor traveler who is then turned away after presenting his or her state-issued, official complete with hologram ID will blame Homeland Security. Does the ongoing collapse of REAL ID leave us vulnerable? REAL ID remains a dead letter. All that remains is for Congress to declare it so. And it may be dawning on Congress that passing it a second time under the name “PASS ID” will not work. One is the issue of whether motorists should be allowed to send texts while driving; the other is whether the state should adopt federal REAL ID standards for driver's licenses. Will the state's traditional hostility to infringement on personal liberties -- think of how long it's taken for smoking bans to take hold, or about how there is no helmet law for adult motorcyclists -- carry the day? Or will the state's moralistic streak -- the one that condones infringements on liberty in terms of gay marriage, blue laws and abortion -- win out? The REAL ID issue is one that has been around for awhile but has come up again because Gov. Sanford is asking the federal Department of Homeland Security to give South Carolina a pass on the adoption of REAL ID, which passed Congress in 2005 but has lagged in implementation. The adoption of REAL ID involves new security requirements for state driver's licenses. South Carolina's political culture is one of hostility to many federal initiatives. Is the governor right to take a stand on this, or is he grandstanding? And what about texting while driving? It's been proven to cause distraction, but is it worse than other driver habits? And if a law passed, would Sanford veto it like he vetoed an ATV safety bill? What's your take? What do you think our state WILL do, and what do you think we SHOULD do on these issues? As 2009 draws to a close, we're inching ever deeper into the corner that Congress painted us into by passing Real ID under the table in 2005. (Recall that Real ID is the failed, Bush-era attempt to turn state drivers licenses into national ID cards by forcing states to collect and store licensee data in databases, and refusing to accept non-compliant IDs for federal purposes, like boarding a plane or entering a federal building. The official deadline for states to comply with the Department of Homeland Security's (DHS) final Real ID rule is December 31, 2009, and an estimated 36 states will not be in compliance by then, leading to some ambiguity for many citizens. For example, will residents of Montana be able to board planes in January 2010 with only a driver’s license (a state-supplied, technically non-compliant document) and without a passport (an identity document issued by the federal government)? Past history strongly suggests that DHS will issue last-minute waivers to states that have not amped up their drivers licenses to adhere to Real ID. Early in 2008, states that actively opposed Real ID received waivers from DHS, nominally marking the states as "compliant" despite strongly-stated opposition to ever implementing Real ID. But waiting in the wings is PASS ID, a bill that attempts to grease the wheels by offering money to the states to implement ID changes. Despite having the appearances of reform, PASS ID essentially echoes Real ID in threatening citizens' personal privacy without actually justifying its impact on improving security. For this reason, PASS ID is not popular -- privacy advocates refuse to support the bill because it still creates a national ID system. It still mandates the scanning and storage of applicants' critical identity documents (birth certificates, visas, etc. ), which will be stored in databases that will become leaky honeypots of sensitive personal data -- prime targets for malicious identity thieves or otherwise accessible by individuals authorized to obtain documents from the database. And on the other side, short-sighted surveillance hawks are unhappy with the bill because they support the privacy violations architected into the provisions of the original Real ID Act. As such, advocates of PASS ID are publicly wringing their hands over the deadline in order to encourage Congress to approve the PASS ID Act before the end of the year. But the fracas over health reform is suffocating any chance for meaningful debate about the merits of PASS ID before the Dec. 31st deadline. On the other hand, the resulting databases filled with scanned identity documents will create tantalizing targets for identity thieves and headaches for people whose digital documents are pilfered; and a national ID system will invite mission creep from the government as well as private entities like credit reporting agencies and advertisers. It's high time for reason to replace the reflexive defense of a failed scheme. Congress should repeal Real ID for real and seek more inspired, protective solutions to identity document security.